Welcome to Southern Exposure, a spacious home on St. John built and decorated in true Caribbean style, featuring expansive views of the open sea and cooling trade wind breezes. Like many St. John homeowners, we too felt the wrath of Hurricanes Irma and Maria in 2017. Our house sustained considerable damage but we are pleased to report that the main house structure survived largely intact and repairable. After considerable efforts by many and a significant investment, we are happy to say that Southern Exposure repairs are completed, and we are now available for your vacation plans! The most unfortunate effect from Irma was that the building we called the cabana — a one bedroom, one bath separate unit — was completely destroyed in the storm. That leaves Southern Exposure as a 3-bedroom, 3-bath home today, instead of the previous 4 x 4. We can readily accommodate 6 adults, and we have options for those wishing to add a child or two (inquire on the details please). To discuss your booking, contact the folks at Seaview Homes, our property managers, at 340-776-6805, or by email at info@seaviewhomes.com. 2018: A new pergola and BBQ area occupy the expanded deck space at the former site of the cabana. Southern Exposure features a huge, sprawling deck perfect for entertaining your guests or a private evening of stargazing. 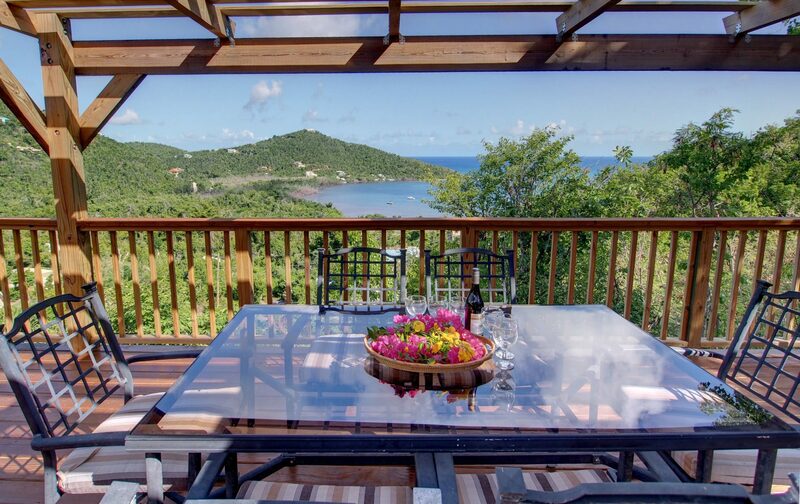 Day and night, views from Villa Southern Exposure’s deck give you 180 degree plus vistas of the Caribbean to the south, and to the broad expanse of the Fish Bay valley. Here, you’ll bask in the warm glow of the morning sun as it rises above St. John’s hills to the east, or while away hours watching sailboats on the beautiful Caribbean Sea. Southern Exposure is a three bedroom, three bath spacious villa located in Fish Bay, on St. John’s south shore, just a quick ten minute drive to Cruz Bay, where you’ll find markets, restaurants, shopping and entertainment. Away from the hustle and bustle of town, Southern Exposure offers guests the quiet and solace that brings people to St. John. The villa comfortably accommodates up to 6 people in 3 bedrooms, each with their own bathroom. The upstairs/downstairs layout provides two separate and spacious communal living areas with a large deck, making this home perfect for families with children, or separate groups of couples wishing some ‘private space.’ The raised deck pool, surrounded by beautiful native stone and coral walls and an array of colorful bougainvillea, allamanda flowers, hibiscus and palm trees, provides a relaxing and quiet way to pass a day, for those who just don’t want to venture out some days. 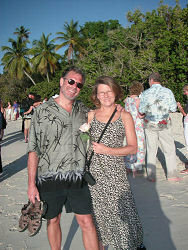 Southern Exposure offers panoramic St. John ocean views and tradewind breezes. There is a second, lower-level covered deck that offers dining and seating off the lower living room. We encourage you to spend a few moments browsing through our house photos on the Photos page, and reviewing the many favorable comments and reviews left by previous guests on the Guest Comments page. Our wonderful property managers at Seaview Homes will be happy to answer any questions you may have about Southern Exposure — after all, their office is just up the street from our home, and they’ve been managing it for years. The team at Seaview will do their best to help you find available dates, arrange the details, and help you to enjoy your dream vacation at Southern Exposure, like so many of our previous guests.